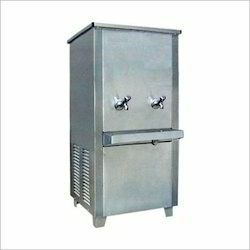 Cool Star model of water cooler has superior quality. In these model water cooler can be outlet cold water and provide space below the compressors for R.O fitting. In these models holes have been given for Bowl fitting, membrane fitting & Motor fitting like skid for R.O fitting. In these model provide different switches in left side of water cooler for operate water cooler and R.O. 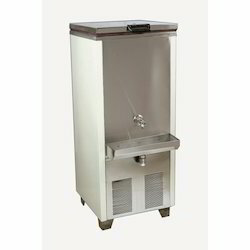 Capacity range start from 20 lt. 150 lt.
Our company is instrumental in offering premium quality Stainless Steel Water Cooler to our valuable customers. Manufactured as per the industry set standards, these coolers are used in food courts, hotels, hospitals and schools. Owing to their flawless design, easy maintenance and optimal performance, these coolers are highly demanded in the market. Owing to our vast experience and knowledge of this domain, we offer premium quality RO Water Cooler to our valuable customers. The offered coolers are known for their consistent performance and high corrosion resistance. These coolers can be custom-designed as per the specifications provided by the customers. COOL STAR the leading manufacturer and supplier of Water Cooler. Further, these oil chillers are also customized as per client’s requirements. In order to deliver best at the clients' end, we test these chillers after regular intervals using latest equipment. 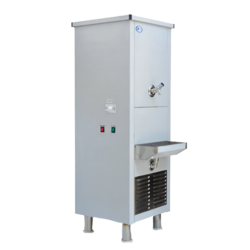 Our range of water chiller is manufactured using high quality raw material, which is procured from trusted vendors spread across the nation.